On vacation recently, I stopped into an independent bookshop that exclusively catered to children’s books and let them know I was looking for charming chapter books. Moments later I had a number of books to choose from and was flipping through the first of four books in the Houndlsey and Catina series. 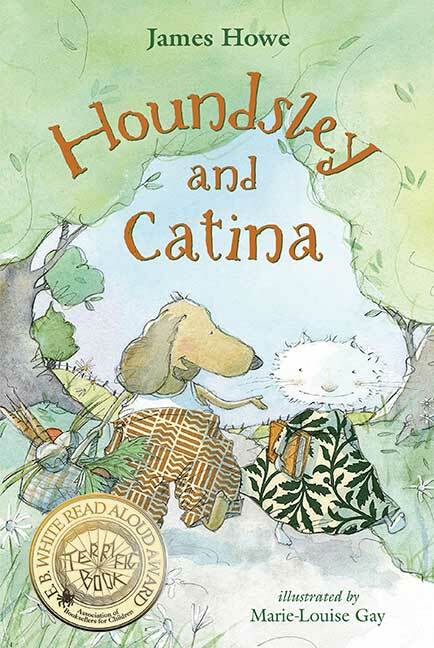 What caught my eye was the mention that Catina (a cat) was vegetarian so her friend Houndsley (a dog) made a meal for her that included grains and tofu. A third guest at their dinner party, a bird named Burt, was surprised to learn that the “worms” he had been eating were really vegetarian. I just had to buy the book! Plus, I loved James Howe’s Bunnicula as a kid. After I read the book with my three-year-old, I returned the next day to get the rest of the series, the artwork is beautiful and the stories are truly charming. In this first book, Catina writes her memoirs because she wishes to be famous but she is not a very good writer. Houndsley is tactful and supportive. In the second chapter, Houndsley is encouraged by his friends to enter a cooking competition but he gets so nervous he even forgets the beans in his three bean (vegetarian) chili. In the third chapter, the friends resolve their experiences in the first two chapters and watch fireflies together. My mother in law said she wished Catina didn’t admit to disliking writing but I thought it was good that she could be honest with her friend. The other books are equally fantastic. I think they are wonderful read-aloud books but would be a good for beginning readers as the print is large and the chapters are short. Veg families will really appreciate the themes of compassion and friendship. Congrats on becoming a mom! I may have to review some more board books, Ten Little Ladybugs is a favorite of my (now) 13 month old. They really love books with photos of babies or high contrast pictures in addition to touch and feel or lift a flap books. Oh, and mirrors are a hit, too. Best wishes! What a great find — I love vegetarian characters in books, especially when they’re portrayed in a positive light! I particularly like that everyone at Houndsley’s dinner party ate vegetarian out of respect for their friend. My 6-year-old, who reads short books herself but likes for me to read chapter books to her, loved this. Given the simplicity of the story, and the fact there are only 3 chapters, I suspect this might be one of the first chapter books she reads herself. I am so thrilled! The other three books are equally charming but Catina’s vegetarianism features most here. It was such a find because most reviews and blurbs leave out the veg friendly details. I am glad she liked it too! We like this book a lot too, my kid brought it in to school for the teacher to read to the class. I love the tofu worms, and the ending which resolves the opening during which H is being critical of C’s writing. Thanks for the review!